Stunning 15.5" sculpture by Franco/Australian sculptor, Frederic Berjot for his Laughing Museum studio. Aptly named 'Dream-girl', this sculpture is in excellent condition. 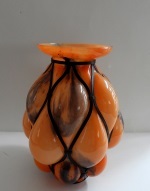 Stunning 8" luster glazed figural vase with nudes both front and back, signed by Jean Barol, circa 1920s. Barol worked for Massier before striking out on his own to start his own studio with Sicard, Alexandre and Carle forming BACS. After leaving BACS with Sicard, he started the Montieres pottery. This stunning signed by Barol has lavish luster glaze and beautiful executed nudes. In excellent condition. Stunning 9" luster glazed vase with Pan/satyr design by Jean Barol, circa 1920s. Barol worked for Massier before striking out on his own to start his own studio with Sicard, Alexandre and Carle forming BACS. After leaving BACS with Sicard, he started the Montieres pottery. This stunning signed by Barol has lavish luster glaze and beautifully executed Pan/satyr. In excellent condition. Stunnning and quite rare 12" vase, 'Les Danseuses' designed by Georges Conde for Mougin, circa 1930s. Take note of the beautiful crystals around the shoulder of the vase. Additional pictures of the dancers surrounding the neck are available. In excellent condition. Exquisite 12" hand-painted plate inspired by the Renaissance by master potter Patrizio Chiucchiu. 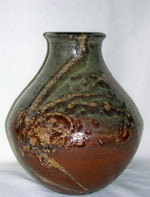 Chiucchiu has chosen to recapture the spirit and technique of sixteenth and seventeenth century Deruta pottery. In excellent condition.